Even a thin story is better than none. 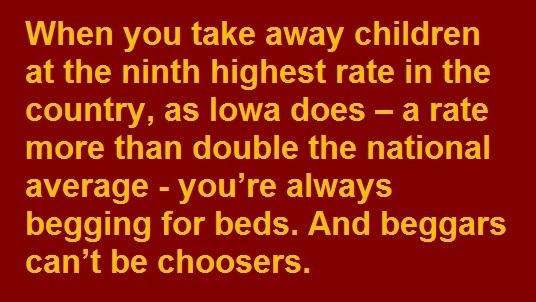 Unfortuinately, that’s what Iowans got. After DRW did the actual reporting, Washington State’s largest newspaper, The Seattle Times was reduced to writing a story based entirely on DRW’s findings. And Iowa’s largest newspaper, the Des Moines Register, was reduced to reprinting the Seattle Times story. Now the Register has begun to catch up; slowly. 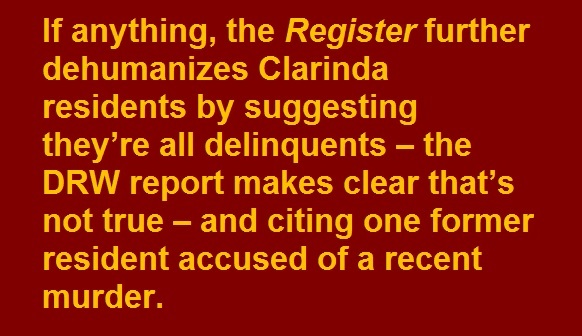 But the story in the Register this week does little more than regurgitate police reports and give enormous amounts of space to statements from an executive from Sequel, the for-profit chain that runs Clarinda. The story includes no interviews with current or former residents. And it gives readers no way to understand the oppressive climate of day-to-day life at Clarinda that DRW found. 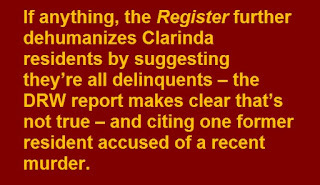 If anything, the Register further dehumanizes Clarinda residents by suggesting they’re all delinquents – the DRW report makes clear that’s not true – and citing one former resident accused of a recent murder. But the story does serve one useful purpose. If you first read the full DRW report – and, in effect, hear the voices of those forced to live there, and you get a feel for the day-to-day oppressiveness of the place, then you will wonder about the willful blindness it take for Iowa authorities to do nothing. That blindness allowed the Sequel executive to gloat that “In September, the state of Iowa completed their on-site audit at Clarinda, which noted no deficiencies and renewed our full licensure status." After the eight boys ran away this year, inspectors determined that the teens who fled were separated from others for weeks after they were found. Those students were supposed to have their status reviewed every three days, but [A state inspector] found that after he began an investigation in May, staffers falsified student supervision plans and forged students' signatures. The facility was given a provisional license afterward, but [the inspector] recommended its full license be restored. Of course, even more than Washington State, Iowa has a strong incentive to ignore problems in group homes and institutions – when you take away children at the ninth highest rate in the country, as Iowa does – a rate more than double the national average - you’re always begging for beds. And beggars can’t be choosers. Gov. 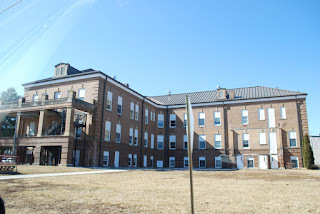 Kim Reynolds has said little about Washington State’s probe into the treatment of youth at Clarinda and has taken no steps to remove any Iowa children from the facility. Of course not. There’s no public pressure on her to do anything.